A football "referee" will be handing out red cards to anyone caught dropping chewing gum in Oxford Street as part of a campaign to clean up the area. The look-a-like of Pierluigi Collina and an Italian football team will give out the warnings on Wednesday on behalf of Westminster City Council. 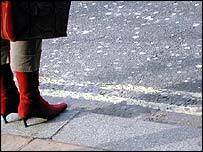 A survey of 503 people commuting into central London showed that 92.2% had found gum stuck to their shoes. Westminster says it pays £90,000 a year to clean up gum on its streets. It estimates there are about 300,000 pieces of gum stuck to Oxford Street, in London's busiest shopping district, at any time. A total of 67% of those interviewed supported a tax on gum companies to pay to clean up the streets.